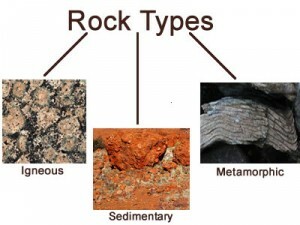 All rocks fit into three categories: igneous, sedimentary, and metamorphic. An igneous rock is made from cooling magnum and causes minerals to crystallize. The type of igneous stone is decided by the texture and composition of the stone. Depending on how fast the magma cools will determine how large the crystals become. Generally, the slower the magma cools the larger the crystals become in the stone. The size of the crystals are known as texture. The composition of the stone is referred to as the amount and type of minerals found in the stone. The most common types of igneous stones formed are granite, basalt, and obsidian. A sedimentary rock is formed from igneous, metamorphic and sedimentary rock particles compacted by pressure and cemented together by acid rain. Most of the Earth’s crust is made up of sedimentary rock. Fossil marks are often found in sedimentary stones. The most common sedimentary stones formed are limestone, travertine, and sandstone. A metamorphic rock gets its name from “meta” meaning change and “morph” meaning form. A metamorphic rock is produced by an increased amount of heat, pressure, or fluids in the Earth’s crust. The most common metamorphic stones formed are marble, slate, gneiss, and onyx.